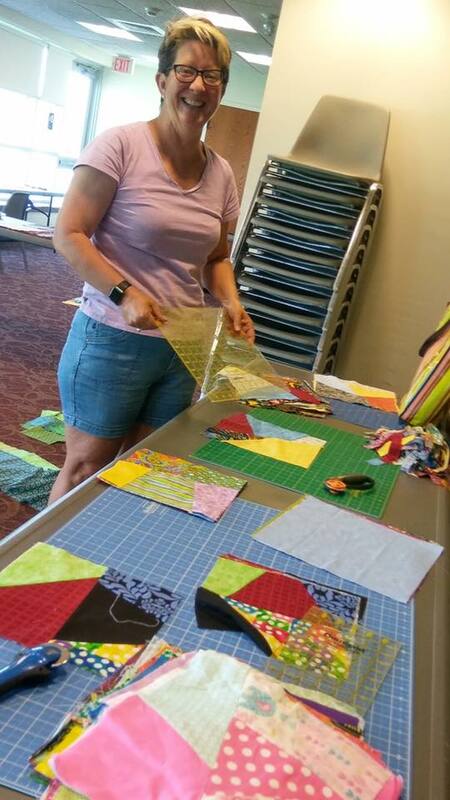 On August 23rd, we had a Quilt Day at The Indian Valley Library. Members of the community volunteered to help us create quilts. They sorted materials, ironed and cut loads of fabric donated by the people of our community, and sewed squares into top quilts. We were very lucky to also have a few quilts donated by a local quilter, Barabra. The goal of the ATW quilt project is to give a quilt to every child in the program, and to create quilts for awareness and fundraising. For our Quilt Day, anyone can come to help - no sewing experience necessary. This event was huge success. We are beyond grateful to our amazing volunteers for helping make Quilt Day fun and productive. We would like to thank Nicole Husbands, an IVPL librarian, for her enthusiasm for Along The Way. She supported us by hosting this event at the library, which included a fabric drive throughout the month of August. One of her jobs at the library is community outreach, and this event allowed the community to get involved in a big way. Our hearts are overwhelmed by the warmth of our community. Thanks again to everyone that helped with this amazing event! If you missed it no worries, we are going to try and do this once a month! We have a lot of fabric! Our next Quilt Day will be Wednesday, October 4th in the Community Room at the Indian Valley Library from 10am-3pm. Join us! Along The Way is 501 (c) (3) tax-exempt nonprofit organization that offers women acceptance, community and hope for life’s journey by providing high-quality, affordable, in-home childcare to single mothers who are working, going to school or training during nights and weekends. If you would are interested in being a partner with ATW please send donation to like to Along The Way, PO Box 711, Souderton, PA 18964, or use our online donation below. All gifts are tax-deductible. Any gift amount will help to bring stability, and a brighter future to women and children.